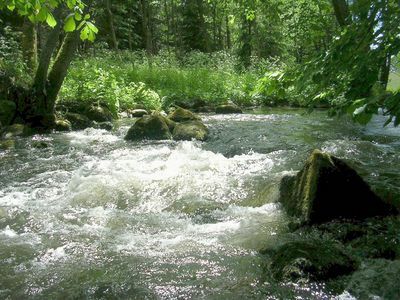 The Łeba river is one of seven important rivers of the Pomorze region, flowing into the Baltic Sea. Its source is situated at 170 m above sea level, south of the village of Borzestowo, in the Kartuzy district. 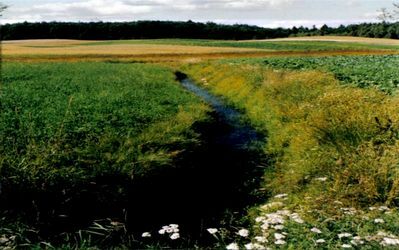 Carving itself a gully through peat meadows in the upper stretch, the river then flows via the lakes of Pojezierze Kaszubskie: Długie, Wielkie, Reskowskie & Sianowskie. North of the village Miłoszewo, the Łeba drops down between the moraine heights. Once past the town of Tłuczewo, the river drops rapidly. It then courses through a valley, digging itself down to 60 meters. This is where it acquires the character of a real mountain river. Meandering through grass lands and wooded hills, its waters foaming around the numerous rocks and narrows, it passes through the Łeba-Reda proglacial valley at an average of 50 m above sea level. Then, in the zone of Strzebielino, it starts its ice marginal stretch, which is clearly visible from the area of Bożepole Małe. It then slows down over a sandy and gravely bed, and runs across Bożepole Wielkie and Łęczyce before reaching Lębork. Via a wide peat valley in the area of the Słowinski National Park, the river then flows through the inshore lake of Łebsko, loosing at 0.3 meters above sea level its proglacial character. After running through the lake, the Łeba finally pours into the sea in place called Łeba, flowing through the Łeba spit as a 4 km wide and deep canal. The river's length is 129.75 km; the total surface area of the river basin is 1801.2 km2, and the first historic records that mention its name appeared in 1140. 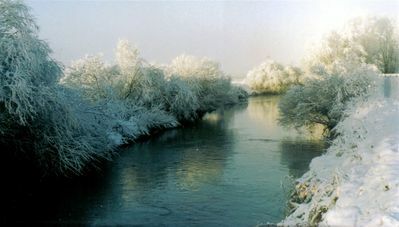 In the context of its River Valley Environmental Protection Programme, the Institute of Environmental Protection included the Łeba river valley into a category A of national ecological corridors. This has been decided due to its multifunction in the area of habitat and procreation of many animal species. Among the fish of the Łeba basin are of outstanding importance: two biological forms of trout - sea trout (Salmo trutta morpha trutta) and brown trout (Salmo trutta morpha fario), as well as the grayling. 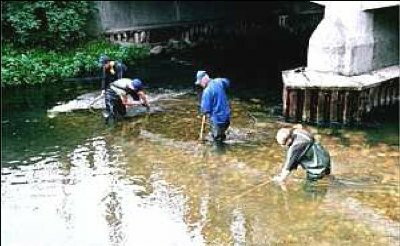 Other species of fish have been determined and are strictly protected: the European bullhead (Cottus gobio), the spined loach ( Cobitis taenia), the Stone loach (Barbatula barbatula), the Brook lamprey (Lampetra planeri). 16 other species of fish are also present in the river. 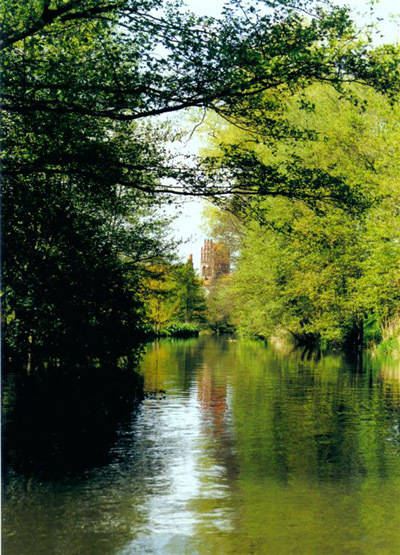 The Association of Friends of the Łeba River (TPRŁ) is active in Lębork since 1998. The organization aims to: initiate and support activities directed to preservation and renovation of the natural environment of the proglacial valley of Łeba, improving the quality of water of the Łeba basin, ecological flow control, management and improvement of the natural values and landscape quality, protection of biodiversity in the proglacial valley. Achievements over the last years: removal of fishermen's nets from the fish passage across the Łebsko Lake as well as establishing a fish ladder in Chocielewko -provided a fish passage for migrating trout and salmon giving both species access to the Łeba River and its influx for spawning. Natural spawning is most important for the condition of the species; that is why it has to be protected and developed. The international recommendations of the Convention of Biological Diversity (Helsinki Convention) obliges the member states to provide a minimum of 50 °/° of natural reproduction of the wild Baltic salmon until 2010. For this purpose the salmon rivers need supervision. Thanks to the good cooperation with the authority of Lębork and the Lębork district, the Association has obtained financial support. This allowed the reconstructing of the natural spawning beds of trout and salmon in the centre of Lębork by laying and grading 152 tons of gravel -sand mixture on the river bottom. The mystery of shaping the spawning nests and laying the eggs can be watched from the bridges on Armii Krajowej and Staromiejskiej Street and was admired by many citizens as well as tourists. 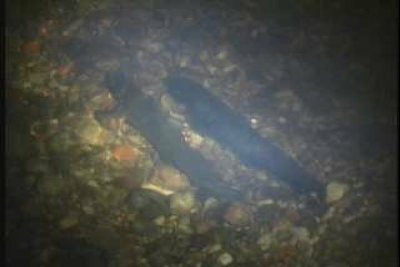 In the last quarter of the year, the female trout lays her eggs into a redd that she has prepared in the gravel on the river's bottom. To prepare the spawning nests, the female turns on her side and with flinging movements of her body digs a shallow hole where the eggs, simultaneously fertilized by the male's milt, are laid. After spawning the female covers the eggs with gravel - this is the incubation mound where the trout fry are born. 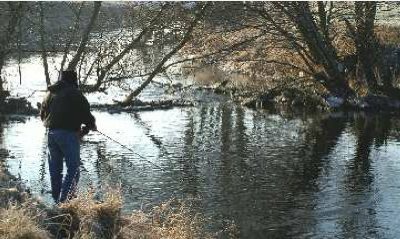 Every year, the Association participates in activities, assigned to protect the trout's spawning. All night, watch duties and patrols are shared among the Association Members, the police, the municipal security guard, the public fishing guard, members of the Polish Angling Association (PZW) and the "Łeba Valley" Fly Fishing Club. This initiative is very effective at reducing poaching of fish in the Łeba basin. The Association supports the implementation of the river's permeability programme, resolved by regional parliament of the Pomorski district. 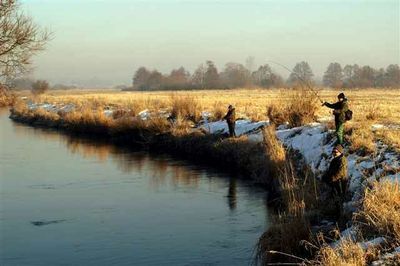 As a result of its proposal, the creation of the fish way in Lębork was included in the long term investment plan for the years 2004-2007, accepted by the city council. Work on the project has started. Construction of the fish ladder will prolong the migrating routes of fish; it will open the procreation possibility in new spawning places as well as increase the touristic value of the city. The Association of friends of the Łeba River cooperates with young people under the International Ecological Education Programme "Green". This programme promotes and forms an environment friendly attitude by creating ecological morals as well as respect for the environment. It encourages the students not only to explore the rivers and streams but also to recognize the problems related to nature preservation. TPRŁ collaborates with the Polish Scouting and Guiding Association (ZHP) team "Zawieja" &The Center of Ecological Education in Lębork. For the past three years, along with the Fly-fishing Club "Łeba Valley", the Association organizes the National Fly-fishing Competition with a Cup from the Association of Friends of the Łeba River's President as a main prize. These competitions are becoming more and more popular. In 2006, more than 100 participants from all over the country have taken some good memories home with them, hoping that this event will enter permanently into fly-fishing canons. Between the competition's rounds the guests have watched the film showing the building up of the spawning places, with the sequences of the spawning itself, revealing the effectiveness of the project. Tekst: Marian Ślęzak, Zygmunt Lisiecki. Wydano ze środków WFOŚiGW w Gdańsku. Współpraca: Centrum Edukacji Ekologicznej w Lęborku.